Service Area: Central Minnesota including the communities of St. Cloud, Sartell, Sauk Rapids, St. Joseph and Waite Park. The Central Minnesota Youth Soccer Association (CMYSA) is an educational, non-profit organization dedicated to fostering a high-quality community-based soccer program for players kindergarten through high school age. 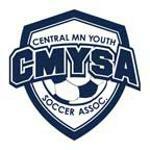 CMYSA offers soccer opportunities for competitive and recreational levels for the youth of central Minnesota. Our Club provides quality programs and resources that move motivated players along in their development of the four pillars of soccer: technical, tactical, physical, and psychological. At the same time, CMYSA understands that youth participate in youth soccer for a variety of reasons and we have a duty to the community to offer programs that encourage, excite, and energize every player, regardless of ability.